KINGSTON, Ont. – As it’s done repeatedly this season, the North Bay Battalion battled to the end, and in record fashion. 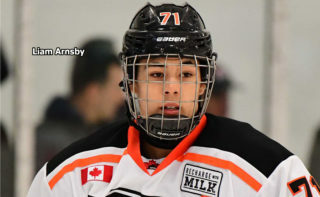 Gabriel Vilardi scored at 14:05 of the third overtime period to give the Kingston Frontenacs a 6-5 Ontario Hockey League victory Saturday night that clinched the teams’ best-of-seven Eastern Conference quarterfinal four games to one. Vilardi and Sean Day each had two goals and two assists, while Ted Nichol and Jason Robertson contributed one goal and one assist apiece for third-place Kingston and goaltender Jeremy Helvig faced 51 shots before 3,567 at the Rogers K-Rock Centre. Justin Brazeau scored a club-record four goals in a playoff game and Rhys Forhan netted the other for sixth-place North Bay, with Christian Propp providing spectacular goaltending, facing 77 shots in the longest game in Battalion history and the third-longest in the annals of the OHL. Matthew Struthers had three assists for the injury- and suspension-depleted Troops. Vilardi took a short pass from Nichol and beat Propp high to the glove side from the mid slot for the winner, Vilardi’s fifth goal of the series, handing the Battalion a fourth straight loss. Propp kept the Battalion alive in overtime, in which Kingston outshot the Troops 44-19, including 20-4 in the first extra session, when the hosts had the first 11 shots. Propp stoned Cliff Pu and Linus Nyman, among others, in the first overtime period and robbed Pu and Eemeli Rasanen in the second. Adam McMaster cut across Helvig’s goalmouth in the third overtime, just failing to get the puck past the kneeling goaltender. With Helvig on the bench for a sixth skater, defenceman Day forced overtime with a heavily screened blast from the blue line at 19:40 of the third period. Kingston, which led 2-0 early but trailed 4-2 after 40 minutes, tied it on goals by Day at 9:56 of the third frame and Robertson on the power play at 12:24. Day converted a cross-crease pass from Nyman, and Robertson one-timed the puck from the left-wing circle on a feed from Pu. Brazeau scored his fifth goal of the series for a 5-4 lead at 16:39, beating Helvig to the glove side on a rush off the left wing as Rasanen screened the goaltender. Vilardi struck on the power play at 1:44 of the first period, snapping the puck home from the left circle on assists by Robertson and Day. 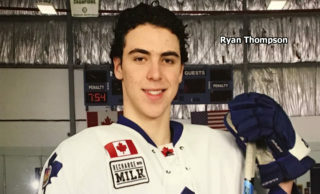 Nichol scored unassisted at 8:23, eluding Adam Thilander at the Kingston blue line and racing away on a two-on-one rush against Jesse Saban, who slid to try to block the scoring shot from the left circle. 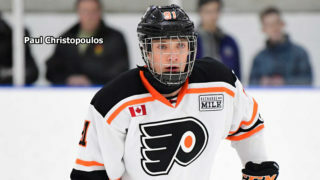 Forhan replied with his first OHL playoff goal at 15:18, darting down the left side and driving to the net past Day to jam the puck behind Helvig, and Brazeau connected at 15:45, taking a pass from Struthers at the blue line and moving down the right wing to beat the goaltender with a fluttering shot. Brazeau then gave North Bay a 3-2 lead with a shorthanded strike at 17:50. 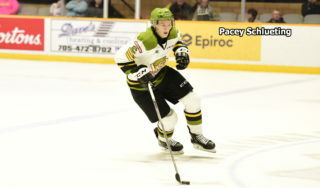 Struthers, who seized the puck high in the Battalion zone, and Brazeau staged a two-man breakaway, with Struthers feeding Brazeau on the right side for the conversion at the crease. Brazeau scored the only goal of the second period at 3:45 after Helvig made the stop on a Riley Bruce blast from the middle of the blue line and the puck soared into the air. Brazeau got his stick on the disc, knocking it into the net on the descent, with referee Dave Lewis confirming the tally upon video review. Jake Henderson hit the right post with a backhander from the mid slot in the 17th minute. The previous longest Battalion game saw Nick Palmieri of the host Belleville Bulls score at 18:44 of the second overtime period for a 3-2 win April 23, 2009, in Game 5 of a conference final. The longest OHL game saw Belleville defeat visiting Kingston 4-3 at 3:51 of the fourth overtime frame March 20, 1990. In the second-longest, the Mississauga St. Michael’s Majors downed the host Barrie Colts at 18:05 of the third overtime period March 28, 2009. BATTALION BULLETS: The last Battalion member to score as many as three goals in a playoff game was Mike Amadio, in a 7-5 road loss to the Peterborough Petes in Game 6 of a conference quarterfinal April 3, 2016 … The Troops’ Luke Burghardt started serving a minimum three-game suspension for a match penalty for high-sticking issued at the end of a 6-3 home-ice loss Thursday night … The Battalion called up Eric Allair, whose season with the junior A Powassan Voodoos is over, for the game … Captain Bruce played a 46th playoff game, eclipsing Matt MacLeod for sole possession of ninth place on the franchise’s all-time list. Bruce and fellow overagers Saban and Henderson played their last OHL game … The Battalion went 0-for-3 on the power play. 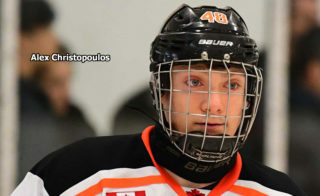 Kingston was 2-for-6 … Opening lines featured Struthers centring left winger Brad Chenier and right winger Brazeau, Kyle Potts centring left winger McMaster and right winger Henderson and Forhan centring left winger Daniel Walker and right winger Andy Baker. 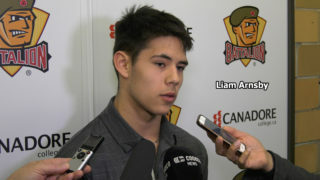 Luke Moncada centred Allair, normally a defenceman, on left wing and right winger Patrick Brown … In addition to Burghardt, the Battalion was without Simon Rose, Kurtis Evans and Brandon Coe … Liam Murray completed a two-game suspension after being assessed a double minor for crosschecking when he hit Coe from behind into the boards in Game 3 … Joe Celestin was the other referee.